So for those who don’t know, Katie is getting married soon!! Since her wedding is coming up, she just had her bridal shower a few weeks ago!! It was so much fun and her bridesmaids all did an AH-MAZING job putting it all together!! 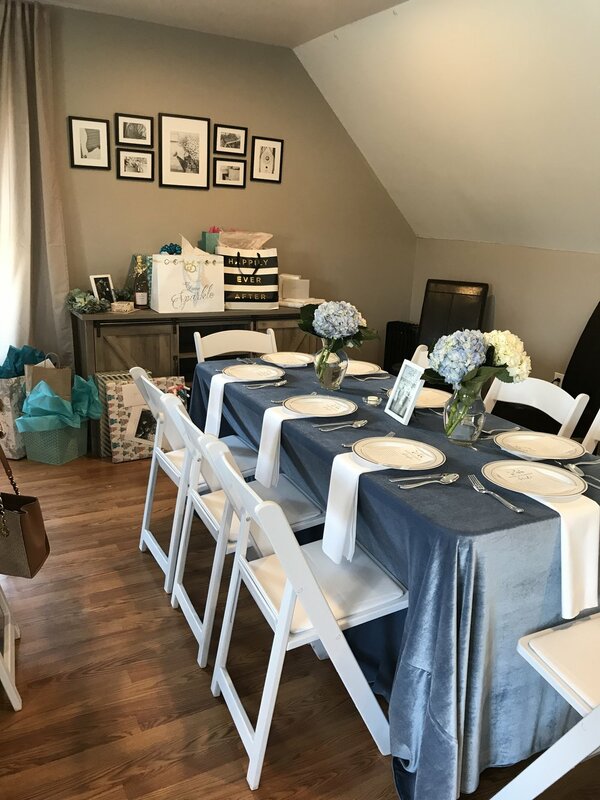 There is alot that goes into planning a bridal shower but it definitely doesn't have to be hard! So I’m here to give you a little advice on everything you need to know to throw the purrr-fect shower for your favorite bride! So rule numero uno is do not let the bride plan her own bridal shower! You would think this is a no brainer, but for some, they may not know. Plus, you may your girlfriend be super Type A in wanting to plan or have input, which is fine, but definitely be sure she is not the one planning the logistical portions of her day. Also, please note that this is a volunteer job. No one should be forced to plan a bridal shower, but it is something super special that you can do for the bride! With that being said usually it is a maid of honor/bridesmaid/sister/mom/bff who plans and throws the bridal shower! It can, also, be a group effort (like Katie’s) where the bridal party or a few people get together to make this special celebration happen! Timing is everything! Typically, a bridal shower is anytime between one to three months before the wedding. Check with your bride to see of some weekends she is available. Take note of any holiday weekends, as those will be top priority for vacations for your guests. I love that in this day and age hosting an event can be easy breezy with e-vites, but there is nothing more special than using beautiful paper to invite your girlfriend’s close family and friends to celebrate her. There are tons of cute places online: Etsy, Vistaprint, Shutterfly, or Minted just to name a few! It’s a great excuse to have fun with design. Invitations should go out no more than 4-6 weeks prior. Also don’t forget to put the brides registry information on the invites! As the host, the guest list should not be too difficult as it is the responsibility of the bride to provide you with that guest list. The rule of thumb is that if they are invited to the bridal shower, then they are also invited to the wedding. However, not all female guests need to be invited to the shower. The guests should be those that the bride is close to. Think immediate family, bridal party, and really close friends. Games are half the fun of a shower! Be sure to check in with your bride to see what she is comfortable playing. Not all brides are down to make wedding dresses out of toilet paper or playing guessing games about her soon-to-be-hubby. Keep it simple and cost effective. Candy jar guessing, bridal themed Mad-Libs, and the clothespin games are true classics. Just keep in mind that if you plan on having your bride open gifts at her shower then I suggest only playing two games. Your bride has a lot on her plate with planning her big day. One way to help her out is to provide thank you notes and have guests write on the envelope their return address. That way your bride can just take those thank you cards, fill them out, and send them out in a timely fashion! Trust me , she’ll love you for it! 7. It’s All in the Details, Darling! The best thing about throwing a shower is you actually do get to enjoy all the fun things you planned! If you keep things sweet and simple then you are sure to host a wonderful celebration for your bride! Keep her in mind with her design, decorations, and activities. You’ll do great! And as always, if you need some consulting advice. Book your consultation here.